Back in the studio this morning, trying to attract the Muse, I'm pushing ahead on the enamel setting, despite feeling that the work is too much the same as some previous creations (but different enamels). Just do it, I tell myself. When we sit own each day and do our work, power concentrates around us. The Muse takes note of our dedication. She approves. We have earned favor in her sight. When we sit down and work, we become like a magnetized rod that attracts iron filings. Ideas come. Insights accrete. I realized again today, as many times in the past when I've had a bit of a creative block, that I haven't bought any new music in some time. So I've caved to Reistance long enough to visit iTunes and purchase a couple of new albums. In my memories, specific albums are attached to major work. Something about the music actually makes the connection to the Muse easier. So today, I'm listening to Barton Hollow by The Civil Wars and Brandi Carlisle's "The Story." That's gorgeous! You set the bezel cup in fresh clay? And you don't have trouble with warpage? Can't wait to see this finished. Well, I didn't leave as much room around this bezel as usual, so it did warp a tad. Usually I mount them onto a back support with space all around and then add syringe work around the perimeter to reinforce the connection. Sadly, the piece shrank unevenly, so the enamel doesn't fit. Time for plan two. Resistance is messing with my plans, of course. I know you will come up with a wonderful answer. Enjoy the process -- even the frustrating parts! Oh, I won't abandon it! I immediately used a pencil and paper to trace the deformed circle, so that I can cut an appropriate piece from copper. It's just a reminder that it's easier to work in the other direction. 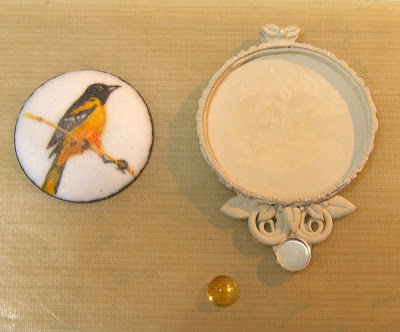 But I love that oriole, so I need to work up a setting for it. Your point about mixing fabrication with powder metallurgy is a good one, though. I've been telling myself that a lot recently with the price of silver clay.